China’s participation in the building of an international “Moon Village” shows the country’s confidence in the field of science, a Chinese space scholar said. a Lunar program prelude to a deeper space probe. The spokesman added that in other words, China should stick to its current lunar exploration agenda and strive to acquire solid findings before diving deeper into space. “The country is discussing possible cooperation with international counterparts, including the European Space Agency (ESA), on building the international ‘Moon Village,'” Tian Yulong, secretary-general of the China National Space Administration, said on Monday. The ESA plan calls for the use of robots on the moon in the 2020s to begin constructing facilities, followed a few years later by the first inhabitants, said the report. Though no official announcement was made on the timetable of the manned lunar base, the ESA announced at a symposium in December 2015 that construction could begin as early as in five years, suggesting that it could provide a potential pit stop for future missions to Mars, the Australian-based science website Science Alert reported. 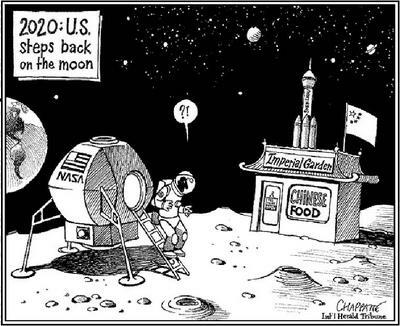 Jiao Weixin, a professor at the School of Earth and Space Sciences in Peking University, told the Global Times on Tuesday that China’s participation in the international construction of the “Moon Village” manifest China’s open-mindedness, and its willingness to create common benefits and win-win results for the international community. The “moon village,” a long-term manned scientific research base, is an inevitable step as lunar studies develop, as it can greatly enhance research and provide unique conditions to study the moon, Jiao said. He added that China should be confident in and stick to its own moon exploration agenda, which has been fruitful, instead of trying to catch up with other countries’ achievements. Jiao said he also believes the “village” will eventually turn into a “city,” and could someday become an affordable tourist destination. Tian also said that China’s Chang’e-5 lunar probe will complete its mission to collect moon rock samples by the end of the year, and the country will land the first probe on the dark side of the moon in 2018. Tian added that the country’s space development program is focused on deep space exploration.